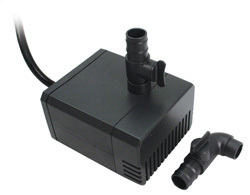 Aquascape Statuary and Fountain Pumps are perfect for running smaller decorative fountains. These high quality, mag-drive or magnetically driven water pumps are ideal for supplying water to run fountains, water features, external filters, spitting ornaments and indoor or outdoor water fountains. This combination of energy-efficient, mag-drive performance, and flow and ease of maintenance make this pump the ideal choice for discriminating water feature owners. Statuary pumps are available in 40, 80, 140, and 250 GPH. These pumps are perfect for smaller decorative fountains, bird baths, and spitters. Statuary DP 40 2" 1.5" 1.25"
Statuary DP 80 2.5" 1.75" 2"
Statuary DP 140 3" 2.5" 2"
Statuary DP 250 4" 3.25" 2.5"
From Anonymous of Blacksburg, , Virginia on 4/14/2014 . From Anonymous of Ross, North Dakota on 9/14/2012 . 11/12/2015 – Will pump #91024 replace mine which 120 v0lts, 80 gpm?